BANGALORE, INDIA: As the four-day international consumer electronics show(CES) begins at Las Vegas tomorrow, here are some of the interesting and cool things that will keep your eyes riveted upon the show for more from Jan. 6-9. Drones: A record 27 exhibitors, up from 16 companies in 2015 are participating in the Unmanned Systems Marketplace at CES 2016. The Unmanned Systems Marketplace covers more than 25,000 net square feet of exhibit space, a 200 percent increase over the 2015 CES. Exhibitors including DJI, Yuneec, Hobbico and Squadrone System will showcase drone and unmanned technologies and initiatives that deliver innovations related to sports, travel, real estate, search and rescue, law enforcement and disaster relief. Robots: Robotics Marketplace at CES 2016 has seen a 71 percent growth in exhibit space. 27 exhibitors will showcase advances in robotic technologies that are transforming the way consumers learn, do business, monitor their health and maintain their households. Major robotic companies participating in the CES include Nidec Corporation, iRobot, ECOVACS Robotics, Robocare, Ninebo, and Future Robot. Smart Cars: The latest advancements in automotive technology will be a major theme at CES 2016, with more than 115 automotive tech companies and 9 automakers including Volkswagen, BMW, Ford and General Motors debuting products. Automotive exhibits will cover more than 200,000 net square feet of exhibit space, a 25 percent increase over the 2015 CES. The show will feature the hottest auto tech trends from parking assistance, collision avoidance and emergency braking to the latest in driverless, electric and energy-efficient vehicles. Smart Home: The connected home will be big attraction at CES 2016. 156 smart home technology solution providers such as Bosch, Honeywell, Vivint, Legrand showcasing the smart home innovations ranging from basic security monitoring, more customized access to appliances, lighting, window coverings, irrigation, entertainment systems and more. 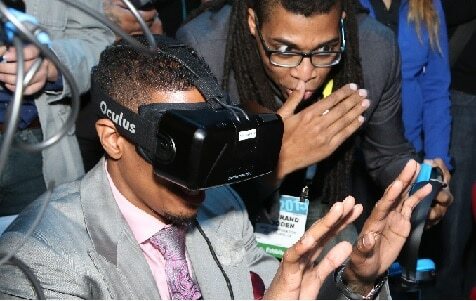 Augmented Reality and Virtual Reality: It is the first time CES has a dedicated space for Augmented Reality and Virtual Reality(encompassing 27,000 square feet in total), featuring 63 exhibitors including companies like Sony, Samsung, HTC, Voke VR, Infinity AR, Facebook’s Oculus VR, Virtuix, and NASA.